It has been a day of the most glorious sunny weather with clear blue skies and light dancing off the water. The greens of the late bursting leaves are as vibrant as a paint pallet. A different world from last Monday when there was rain hail and sleet! Our birds are continuing incubation with the same singlemindedness they began with. Today though has been a bit of a trial as they have built the nest up and lined it so well that they are finding it difficult to keep cool. Something like being wrapped in a winter tog duvet with your back exposed to a sunlamp. Both birds combat this by panting and sticking out their sorbet pink tongues like dogs – but with no dribble. Relief came for the birds at four o’clock when clouds rolled in with a shower but it was a bit disappointing for all of those planning to have an evening picnic by the Lakeshore and conduct their own Springwatch. Assuming our calculations are correct, this is day 23 of incubation. Things remain calm at the nest which is good news as there nothing significant to report. Ospreys are individuals, this is plain to see with this pair, as the nest is adorned with things ranging from decking, to plastic, to cow manure…our male is a collector! One thing the birds do seem to dislike are the cows….unlike last years pair. This couple take exception to the animals grazing too close below the nest….really all individuals they must be. Pictures & Webcam updates are back ! 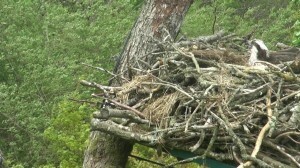 Thankfully we have restored our nest pictures, and our webcam feeds. Huge thanks to the Forestry Commission Radio and Electronics Branch, who identified the problem and worked with local staff to resolve it without affecting the birds. 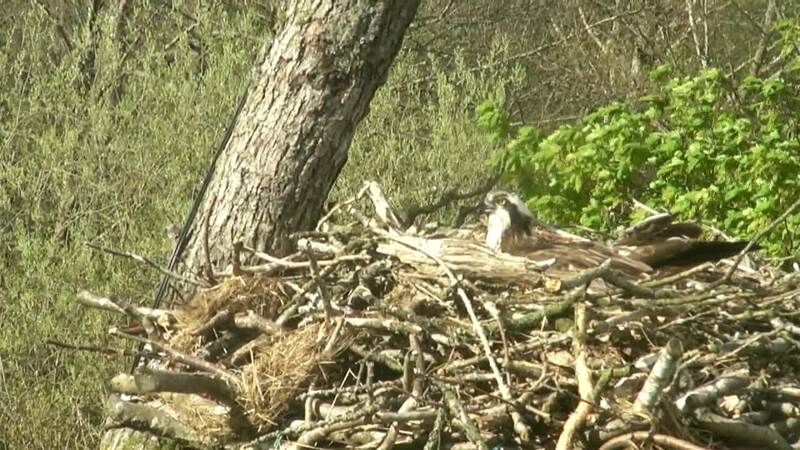 You can also now see image grabs via our webcam again, click on the Latest News then Osprey Webcam icon on the homepage. More updates and photos to follow…..
Just to let you know that we have lost our nest pictures, and webcam updates. Our engineers are working on the problem and will hopefully get the issues resolved soon. After a good start at incubation on one egg on Tuesday morning (May 7th) the young couple have gone on from strength to strength. Ospreys generally lay up to three (rarely four) eggs at two day intervals so we were waiting eagerly to see if there were any signs of a further addition to the nest on Thursday. As we cannot see into the nest cup we have to go on informed guesswork and the birds’ behaviour. On Thursday morning we watched closely as KL bent her head down into the nest and gently rolled the eggs around. She appeared to be moving more than one so we were pretty convinced there had been a happy event during the night. On Friday the pair were still mating successfully so we had great hopes there might be a third egg in the pipeline – ready to lay on Saturday. Ospreys usually do not continue to mate after the last egg is laid and we have not seen any more attempts today, Sunday. So, we can say that they definitely have one egg, they probably have two eggs and they might have three eggs! Our webcam testing is going well, and despite the difficulties which our remote location sets us, we should soon be able to send live web images up to this site every 5 minutes…..fingers and talons crossed ! A big thank-you to BBC Cumbria, and the Forestry Commission Radio and Electronics Branch….you would not believe how complicated this is proving to be ! We will keep you posted. We have at least one, perhaps two eggs. Since yesterday (Tuesday 7th May), a marked change in behaviour was noted in both KL, who tended the nest, sat at regular intervals, then moved around, and the male continued to bring in material. By yesterday afternoon, KL had sat, appearing regularly to turn the egg(s), and when the male has brought in fish, she goes off, and he takes his turn to incubate….classic behaviour suggesting the start of laying their clutch. What is also interesting, is that the birds continue to mate, on changeover, suggesting that there are still more eggs to be produced in the days going forward. 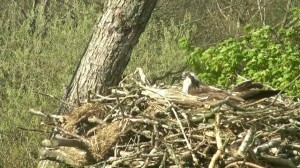 Here KL is happily incubating, taken this afternoon (Wednesday 8th May) at 16.55. Things have quietened down on the nest site as the earlier osprey couple seem to have left the immediate area, leaving KL and her mate to consolidate their position. There is plenty of nest building going on with branches, fencing planks and rush from the marsh being brought in. The male bird seems very DIY minded and spends time shuffling all the material around- sometimes it looks like he is swimming in old grass and sticks. KL inspects it afterwards but sensibly only does a minimum of rearrangement. She has a hearty appetite for fish, which her male supplies her with and spends a lot of her time in or perched around the nest. It would be nice to think that the previous pair had taken up another of our nest platforms but there is no evidence of this.Often displaced ospreys will build a frustration nest somewhere or perhaps they have given up altogether and are winging their way back to their natal sites.